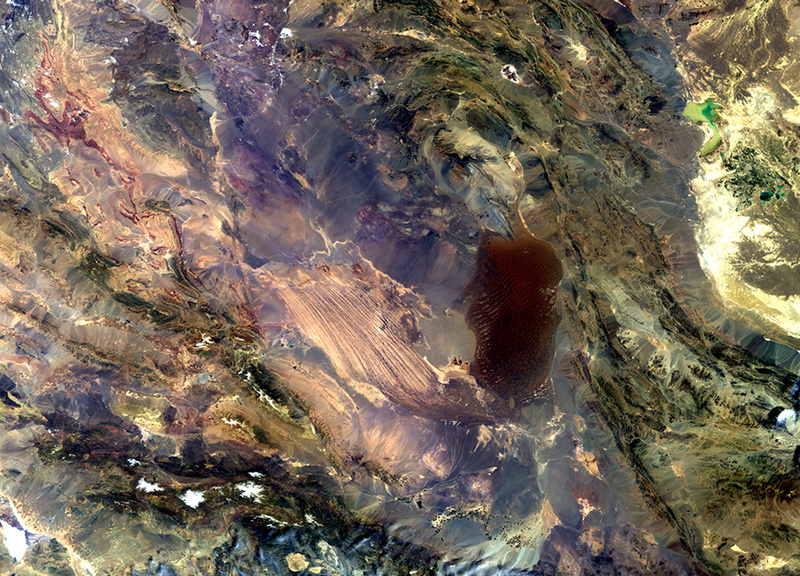 The Dasht-e Lut salt desert in southeast Iran is captured in this Envisat image. The desert is often called the 'hottest place on Earth' as satellites measured record surface temperatures there for several years. The highest land surface temperature ever recorded was in the Lut Desert in 2005 at 70.7oC, as measured by NASA's Aqua satellite. The light area in the centre of the image are the long, parallel wind-carved ridges and furrows. The darker area to the east is an extent of massive sand dunes, some reaching up to 300 m tall. In the upper-right section we can see a light green, shallow body of water that straddles Iran's border with Afghanistan. With their arid surroundings, the wetlands in this border region have been a major source of food and fresh water for thousands of years, as well as an important stop for migratory birds. But irrigation expansion combined with droughts have caused the water levels in these wetlands to drop significantly - and some years even dry up. In the lower-left we can see the white, snow-capped Jebal Barez mountains. A major earthquake struck about 100 km east of the snow-caps in 2003, its epicentre near the ancient city of Bam (lower-central portion of image). Iran experiences frequent tectonic activity as several major fault lines cross the country.